This page features many of the awards the Estate Dogs team has won along with champion German Shepherds we are proud to have owned. Bill Price the only American to have received the coveted Universal Seiger Award in OG Schleswig's clug in Germany. 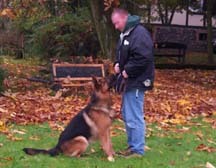 Mr. Price specializes in Schutzhund training and breeding. Besides Schutzhund he also has extensive experience in obedience, agility, tracking and police search. Training and breeding is available as well for Rottweilers, Doberman Pinschers, Giant Schnauzers and, of course, imported bloodlines. Pictured (center) is Mr. Price (shown with Andy von Eisbach) receiving the Universal Sieger Award in 1994. His son Shane Price (shown far left with Eiko) receiving Vice Universal Sieger. Eiko is son of the famous Sieger V-H Zamb von der Wienerau. ALL these awards in one show at one time! Bill Price as our "Professional Trainer." Multiple First Place awards in Germany. National Competitor and has educated award winning trainers. 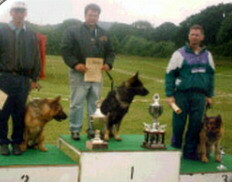 Estate Dogs has many years of experience in developing and breeding the TOTAL GERMAN SHEPHERD DOG. We breed to the World Standard concentrating on the working ability and temperament of the breed. Our goal is to breed a dog that has the ability to obtain Schutzhund titles and conformation ratings of the highest possible rank. We offer titled and untitled dogs ranking from club trials to world events. Furthermore, provide puppies and estate companion dogs suited to your personal needs.